Dave Brewer is a former New York studio musician w/extensive experience with his own groups as well as others. He was a drummer/percussionist with the First Moog Quartet, recording an album and embarking on a nationwide tour which included Carnegie Hall and a nationally televised Boston Pops Orchestra concert. His diverse background includes performances and recordings with The Soul Set, The Sea World Showband, The Ameritech Chorus Band, liturgical programs, and a circus band. The Dave Brewer Jazz Ensemble has performed at museum and college concerts, club appearances, workshop programs, and educational school concerts. Creative Drumming with Dave is a multi-dimensional learning system created and developed by Dave. 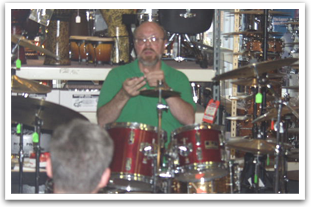 The system develops dynamic drumset mastery and includes workshops, clinics, mini-courses, jams, master classes, drum circles and private instruction.